Background: The use of intermittent preventive treatment in pregnancy with sulfadoxine/pyrimethamine (IPTp-SP) for malaria remains an important tool for improving pregnancy outcome in malaria endemic areas. Objective: To assess the knowledge, attitude, and factors associated with the use of IPTp-SP among antenatal clinic attendees in Ilorin. Materials and Methods: A prospective, multicentre, cross-sectional study among consenting parturients receiving antenatal care at three public health facilities in Ilorin, Nigeria. Statistical analysis was conducted with the Statistical Package for the Social Sciences version 20.0 software (SPSS Inc., Chicago, IL, United States) with the calculation of percentages, chi square, odds ratios (ORs), and confidence intervals (CIs); P < 0.05 was considered significant. Results: There were 422 participants with mean age of 28.8 ± 4.7 years and 368 (87.2%) were aware of the use of IPTp-SP for malaria prevention, while 388 (91.9%) were willing to use IPTp-SP. Only 154 (36.5%) had prescription for IPTp-SP among whom 139 (90.3%) were compliant; IPTp-SP uptake in preceding pregnancy was 148 (59.7%). The most common reason for the nonuse of IPTp-SP prescribed was the fear of harm to the fetus (53.3%). 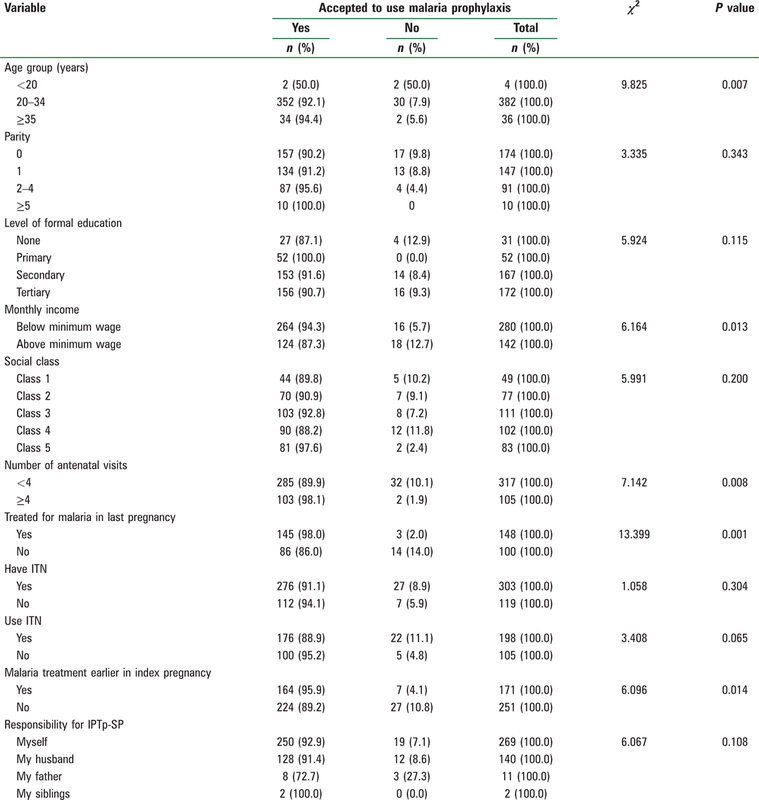 Significant determinants of willingness to use IPTp-SP were maternal age (P = 0.007) and monthly income (P = 0.013), IPTp-SP use in preceding pregnancy (P = 0.001), and the treatment for malaria in index pregnancy (P = 0.014). On logistic regression, maternal age <20 years (OR = 36.457, 95% CI = 2.260–588.011; P = 0.011) and the use of IPTp-SP in preceding pregnancy (OR = 0.051, 95% CI = 0.010–0.252; P = 0.001) were significant predictors of willingness to use IPTp-SP. Conclusion: Parturients desire IPTp-SP, but the prescription rate by healthcare providers was low. Healthcare providers should increase the prescription and address the concerns about its teratogenicity. Governments and other agencies should prioritize free provision and the availability of SP at health facilities. Malaria remains a major public health problem, especially in sub-Saharan Africa (SSA) with medical, economic, and social sequelae. Malaria potentially affects about 50% of the world’s population, majority of whom live in SSA, especially pregnant women and children under five.,,, Globally, 30 million women develop malaria in pregnancy annually with about 10,000 maternal and about 200,000 newborn deaths., Malaria accounts for about 15% of maternal anemia, 5–14% of low birth weight, and it places a strain on the weakened health systems in endemic countries. In Nigeria, malaria accounts for 11% of maternal deaths, and other morbidities include maternal anemia, low birth weight, still births, and miscarriages. Research reports suggest that reduced maternal immunity from increased steroid levels in pregnancy, reduction in gamma globulin synthesis, inhibition of reticuloendothelial system, and increased adherence of parasitized erythrocytes to chondroitin sulfate A expressed in the placenta contribute to the high incidence of malaria and its complications in pregnancy. This is worse in the first and second pregnancies, because antibodies to the parasitized red blood cell develop after the first pregnancy, and its titer increases with each pregnancy. Every pregnant woman living in an area of high malaria transmission such as Nigeria has malaria parasitemia irrespective of malaria symptoms, while the placenta is the preferred site of sequestration and development of parasites. Efforts toward preventing malaria in pregnancy include the use of insecticide-treated bed nets (ITN), intermittent preventive treatment (IPTp), and adequate case treatment of acute malaria; however, the uptake of IPTp by parturients has been low. IPTp involves the use of therapeutic dose of antimalarial at regular intervals by asymptomatic individuals, and sulfadoxine/pyrimethamine (SP) has been recommended (IPTp-SP). IPTp-SP has been adopted in many African countries, because it can be easily administered to antenatal clinic (ANC) attendees in endemic areas. However, its effectiveness has been limited by the nonattendance of ANC by some women, late booking, noncompliance, cost, and resistance strains., Despite these, SP offers both therapeutic and prophylactic effects which remain effective in pregnancy. This study is aimed at assessing the knowledge, attitude, and factors associated with the use of IPTp-SP among pregnant women in Ilorin, Nigeria. The study was a prospective, multicentre, cross-sectional study conducted at three public health facilities in Ilorin (General Hospital, State Specialist Hospital and University of Ilorin Teaching Hospital, Ilorin). The facilities attend to parturients including junior and senior civil servants and other members of the populace; the services are provided by midwives, interns, medical officers, and consultants. Participants were parturients receiving antenatal care at any of the study sites during the study period. The inclusion criteria were gestational age of at least 26 weeks and consent to participate in the study. Exclusion criteria were gestational ages below 26 weeks gestation and refusal to participate in the study. The sample size was calculated using the formula for descriptive studies, a prevalence of 48%, and attrition rate of 10% to yield a minimum sample size of 420 participants. The sampling method was purposive sampling; information about the study was provided to parturients at the ANC, they were screened for eligibility using the study criteria, and an informed consent was obtained. Each participant completed a pretested, self-administered questionnaire designed for the study. Participants who could not communicate in English language had the questionnaire administered by trained research assistants. Information obtained from the questionnaire included sociodemographic characteristics, knowledge on malaria, malaria chemoprophylaxis using SP, and the attitude of participants to malaria prevention. IPTp-SP was defined in the study as the use of three tablets of SP combination for malaria prophylaxis in second or third trimester. IPTp-SP use was elicited using the common patent names of SP available in our environment as well as the dosing, that is, a drug comprising three tablets swallowed at once for malaria prevention as well as the documentation in the case files. The information obtained was analyzed using the Statistical Package for the Social Sciences version 20.0 software (SPSS Inc., Chicago, IL, United States) with the calculation of percentages, chi square, and odds ratios (ORs) with 95% confidence interval (CI). Administrative approval was obtained from the Kwara State Ministry of Health before commencement of the study. There were 422 participants. The mean age was 28.8 ± 4.7 years; 31 (7.3%) had no formal education, 174 (41.2%) were primigravida, and 185 (43.9%) were in social classes 4 and 5, while 280 (66.4%) earned less than the National minimum wage [Table 1]. 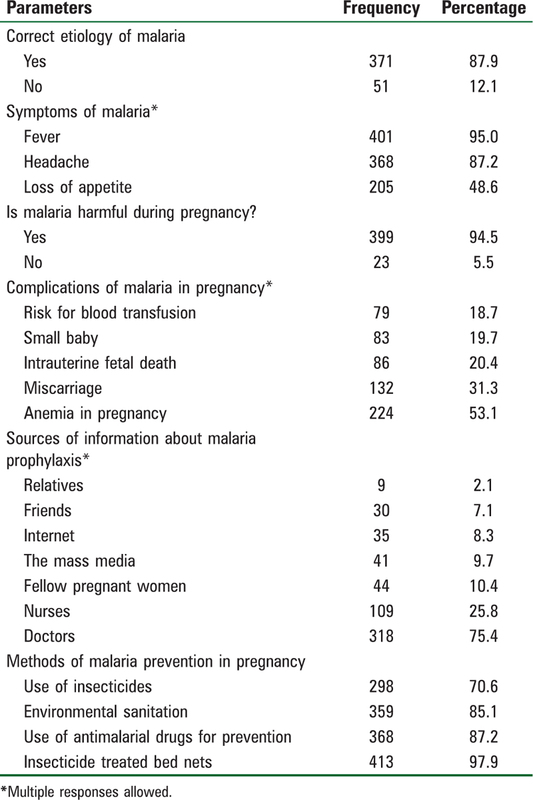 From [Table 2], 399 (94.5%) clients opined that malaria was harmful in pregnancy; information about malaria prophylaxis in pregnancy was obtained mostly from doctors (318; 75.4%). Participants were aware of the use of insecticides (298; 70.6%), malaria chemoprophylaxis (368; 87.2%), and the use of ITN (413; 97.9%) as methods of malaria prevention in pregnancy. The common complications of malaria in pregnancy identified by participants were anemia in pregnancy (224; 53.1%), miscarriages (132; 31.3%), and intrauterine fetal death (86; 20.4%). In [Table 3], 388 (91.9%) were willing to use IPTp-SP, 154 (36.5%) had prescriptions for IPTp-SP in index pregnancy among whom 139 (90.3%) complied with the prescription; the most common reason for noncompliance was fear that it may harm the fetus (53.3%). In addition, 148 (59.7%) used IPTp-SP in preceding pregnancy and although 303 (71.8%) had ITN at home, only 198 (65.5%) slept under the net. All participants who used IPTp-SP paid for the drug with the parturients responsible for payment in 269 (63.7%) and the male partner in 140 (33.2%) of the cases. The significant predictors of acceptance of IPTp-SP were the maternal age (P = 0.007), the monthly income of the woman (P = 0.013), the number of ANC visits (P = 0.008), the use of IPTp-SP in preceding pregnancy (P = 0.001), and the treatment for malaria in index pregnancy (P = 0.014) as shown in [Table 4]. In [Table 5], logistic regression showed that significant determinants of the willingness to use IPTp-SP were maternal age less than 20 years (OR = 36.457, 95% CI = 2.260–588.011; P = 0.011), the number of ANC visits (OR = 11.832, 95% CI = 1.500–93.316; P = 0.019), and the treatment for malaria in index pregnancy (OR = 0.051, 95% CI = 0.010–0.252; P = 0.001). In this study, the mean age was 28.8 ± 4.7 years and the majority of the participants (80.4%) had at least secondary education. Interestingly, most of the participants (70.2%) were of low social class and 66.4% of them earned less than the national minimum wage. There was a high awareness about the harmful effect of malaria on pregnancy, malaria chemoprophylaxis, and the use of ITN for malaria prevention in pregnancy. Nine out of 10 parturients were willing to use IPTp-SP, although only about one in four had IPTp-SP prescribed with a 90% compliance with the prescription. The major concern for noncompliance was fear of teratogenicity. All participants who used IPTp-SP paid for the drug mostly by the parturients. The significant predictors of acceptance of IPTp-SP were younger maternal age, maternal monthly income, number of ANC visits, use of IPTp-SP in preceding pregnancy, and treatment for malaria in index pregnancy. The mean age in this study was comparable to reports from similar studies in Nigeria;, this represents the reproductive age for procreation in this environment. The high literacy level of participants may be a reflection of the location of the study sites in a state capital with high population of civil servants and other educated inhabitants. The statistical significant effect of age especially younger women who were mostly primigravidae in the study has been reported by other researchers., We opine that this may be due to the observation that primigravidae are often anxious and apprehensive which encourages ANC attendance and compliance with medications unlike women of higher parity. The high knowledge of the etiology of malaria was consistent with reports from Nigeria and Northern Ethiopia, where the level of education was reported as a predictor of positive malaria-related knowledge, attitude, and practice. The knowledge of the etiology of malaria has also been reported to be higher in populations with a high use of ITN as observed in this study. Another report showed lower knowledge of the harmful effect of malaria among participants with lower formal educational status. The high knowledge of the symptoms of malaria in this study may encourage early presentation for care which may limit associated possible morbidity and mortality and favor the realization of the Nigeria National Malaria Control Program objective. Awareness of the participants about IPTp-SP was similar to reports from other studies conducted in communities with high level of formal education., The lack of statistical significant association between owning and using ITN relative to the uptake of IPTp-SP as reported in this study corroborates previous reports from south east Nigeria and Kenya. We suppose that this may be due to a feeling of a sense of protection from the ITN use that may make parturients to downplay the use of IPTp-SP. In addition, IPTp-SP is used by parturients only unlike ITN, which is used by the general population. IPTp-SP consists of the administration of curative doses of SP as the drug of choice at least twice from quickening till delivery irrespective of whether the woman is infected or not. Despite its advantage, uptake continues to be reported as low in SSA contrary to the projected 80% coverage by the World Health Organization. This may not be unrelated to the prevalent opinion in our environment that individuals needed to be sick before taking medications. 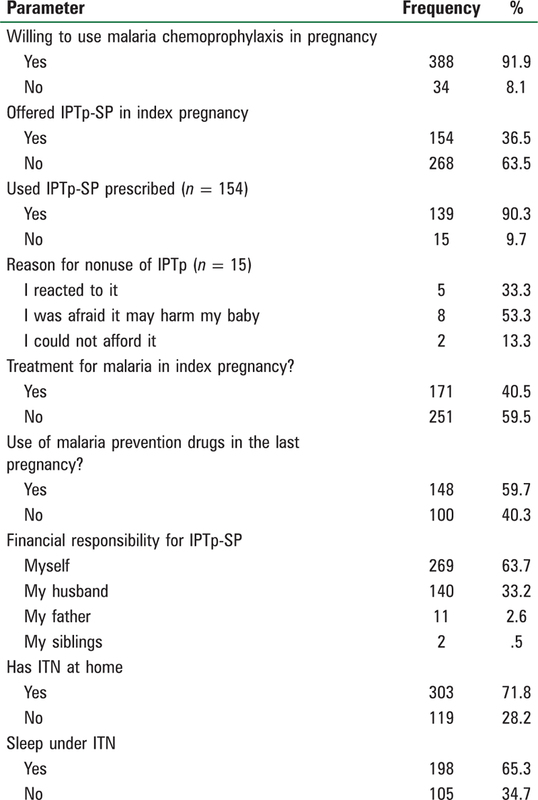 Other challenges of the uptake of IPTp-SP include the low rate of prescription by health providers as noted in this study; another study reported that some health providers still prescribe agents such as Daraprim and Chloroquine for malaria prophylaxis in pregnancy when these have long been delisted. This brings to the fore the need for regular update on current global practice among health providers. In many countries including Nigeria, parturients are required to pay for IPTp-SP; this additional cost may discourage women of low-income status and exclude them from the benefits. IPTp-SP is recommended to be administered by directly observed therapy (DOT); this poses another challenge. In a study, only 14.3% took IPTp-SP by DOT while 61.1% did not use the IPTp-SP at the health facility because they could not bring their personal drinking cups from home. Periodic shortages of SP at health facility pharmacy has also been reported. Many parturients are concerned about possible teratogenicity from IPTp-SP; this has been expressed in previous reports and represent an important knowledge gap which should be addressed during antenatal health talk or at the point of prescription. In 2013, an estimated 15 of 30 million pregnant women in SSA did not receive a single dose of IPTp-SP due to these challenges. This necessitated the call by the rollback malaria partnership for governments to provide funds for procurement and supply of IPTp-SP as well as reduction or elimination of user fees for antenatal care services to encourage IPTp-SP uptake. Healthcare providers should correct the misconception of possible teratogenicity from IPTp-SP since SP has been reported to have a good safety profile.The study concludes that although parturients were desirous of using IPTp-SP, prescription rate by healthcare providers was low. We recommend that healthcare providers should increase the prescription rate of IPTp-SP and correct the misconception about its teratogenicity. Governments and other agencies should prioritize free provision and the availability of SP at health facilities. World Health Organization. Roll Back Malaria: Malaria in pregnancy. Available from: http://www.rbm.who.int/cmc_upload/0/../RBMInfosheet_4.htm. [Last accessed on 2017 May 5]. Federal Ministry of Health. National Malaria Control Programme Abuja-Nigeria: Strategic Plan 2009-2013; A Road Map for Malaria Control in Nigeria. Abuja: FMOH; 2008. p. 23-4. World Health Organization. African Summit on Roll Back Malaria: The Abuja Declaration on Roll Back Malaria in Africa by the African Heads of State and Government. 25th April 2000, Abuja, Nigeria. Available from: http://www.rollbackmalaria.org/docs/abuja_declaration.pdf. [Last accessed on 2017 May 14]. Akaba GO, Otubu JA, Agida ET, Onafowokan ON. Knowledge and utilization of malaria preventive measures among pregnant women at a tertiary hospital in Nigeria’s Federal Capital Territory. Niger J Clin Pract 2013;16:201-6. Agan TU, Ekabua JE, Udoh AE, Ekanem EI, Efiok EE, Mgbekem MA. Prevalence of anaemia in women with asymptomatic malaria parasitaemia at first antenatal care visit at the University of Calabar Teaching Hospital, Calabar, Nigeria. Int J Women’s Health 2010;2:229-33. Grobusch MP, Egan A, Gosling RD, Newman RD. Intermittent preventive therapy for malaria: Progress and future directions. Curr Opinion Infect Dis 2007;20:613-20. Rogerson SJ, Chaluluka E, Kanjala M, Mkundika P, Mhango C, Molyneux M. Intermittent sulfadoxine pyrimethamine in pregnancy: Effectiveness against malaria morbidity in Blantyre. Malawi. Trans R Soc Trop Med Hyg 2000;94:549-53. Akinleye SO, Falade CO, Ajayi IO. 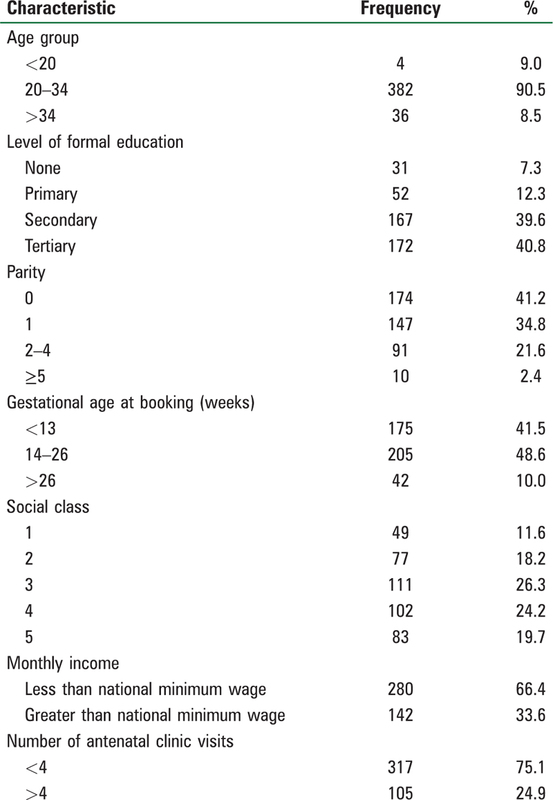 Knowledge and utilization of intermittent preventive treatment for malaria among pregnant women attending antenatal clinics in primary health care centers in rural South West Nigeria: A cross-sectional study. BMC Pregnancy Childbirth 2009;9:9-13.
ter Kucle FO, van Ejik AM, Filler SJ. Effect of sulfadoxine pyrimethamine resistance on the efficacy of Intermittent preventive therapy for malaria control during pregnancy: A systematic review. JAMA 2007;297:2603-16. Amoran OE, Ariba AA, Iyaniwura CA. Determinants of intermittent preventive treatment of malaria during pregnancy (IPTp) utilization in a rural town in Western Nigeria. Reprod Health 2012;9:12. Belay M, Deressa W. Use of insecticide treated nets by pregnant women and associated factors in a predominantly rural population in Northern Ethiopia. Trop Med Int Health 2008;13:1303-13. Musa OI, Salaudeen GA, Jimoh RO. Awareness and use of insecticide treated nets among women attending antenatal clinic in a Northern state of Nigeria. J Pak Med Assoc 2009;59:354-8. Adedotun AA, Morenikeji OA, Odaibo AB. Knowledge, attitude and practice about malaria in an urban community in South western Nigeria. J Vector Borne Dis 2010;47:155-9. World Health Organization. Global Strategy Plan 2005–2015. Geneva: WHO; 2005. Available from: www.rollbackmalaria.org. [Last accessed on 2016 Nov 30]. Njoroge FK, Kimani VN, Ongore D, Awale WS. Use of insecticide treated nets among pregnant women in Kilifi District, Kenya. East Afr Med J 2009;86:314-22. Akaba GO, Otubu J, Agida ET, Onafowokaan O. Knowledge and utilization of malaria preventive measures among pregnant women at a tertiary hospital in Nigeria’s federal capital territory. Niger J Clin Pract 2013;16:201-6. Roll Back Malaria Partnership. Global Call to Action to Increase National Coverage of Intermittent Preventive Treatment of Malaria in Pregnancy for Immediate Impact. April, 2015. Available from: https://www.isglogal.org. [Last accessed on 2017 Oct 20]. Falade CO, Yusuf BO, Fadero FF, Mokuolu OA, Harmer DH, Salako LA. Intermittent preventive treatment with sulfadoxine-pyrimethamine is effective in preventing maternal and placental malaria in Ibadan, South-Western Nigeria. Malar J 2007;6:88-92.